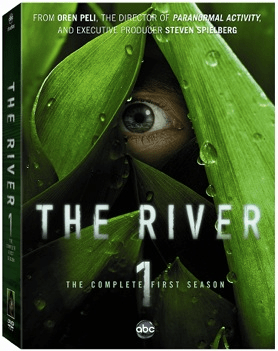 TV on DVD: "The River: The Complete First Season"
The found footage trend is here to stay, whether you like it or not. With the advent of digital media and online video accessibility, younger audiences are used to grainy video, hand held camera work and unknown actors performing in front of the camera. How else can you explain the success of Paranormal Activity, Chronicle and The Last Exorcism. Those successful movies were aimed squarely at a younger audience and they paid off. It seemed inevitable that one of the major broadcast networks would try their hand at creating a series that mimics these movies, as well as the hundreds of reality shows found on basic cable. ABC struck a deal with Steven Spielberg, no less, who backed an idea by Paranormal Activity mastermind, Oren Peli, for a spooky series about an ill-fated trip down the Amazon. The result was The River. The series premiered this winter to great fanfare and seemed like a surefire hit. After the premiere, though, it nosedived in the ratings and was ultimately canceled after its initial 13-episode run. In my opinion the show failed to gain an audience for two reasons: 1) The commercials and 2) The cast had two too many recognizable actors to really pull off that this was “found footage” rather than an elaborately constructed TV show put together by two of Hollywood’s most powerful men (if you don’t think Oren Peli is powerful, you’re gravely mistaken). Sitting down to watch the first and only season on DVD, I found The River much more compelling than when I watched it during its network run. The set-up- the search for a missing TV personality (last seen sailing into the Amazon) by his family, old crew and mysterious new acquaintances that takes them into the darkest depths of South America- is great and the imagery the writers and producers came up with was excellent. As with any series that makes its way to home video, watching multiple episodes uninterrupted heightened the suspense and made certain sequences much creepier (the hanging dolls still give me bad dreams). When I watched these same hours of TV during their initial run, I was annoyed by the sudden breaks in tension that came with the commercial breaks. I know, I know, all network and basic cable television has these breaks, but for some reason, the breaks in The River really ruined the whole found footage aspect. So much so that my mind would drift and I’d become hyper critical of the writing or acting. On DVD, with everything in full-steam-ahead mode, I didn’t mind the plotting or characterizations as much. The more I traveled down The River this time around, it was more fun. Still, I did have trouble always believing the series because the cast included Bruce Greenwood (Star Trek) or Leslie Hope (24). These two great character actors, while playing their roles with the same strength they’ve brought to ever part they’ve ever gotten, took me out of the found footage idea. I realize that the whole found footage genre is just another storytelling tool, but part of the fun is truly believing that what you’re seeing could be true. That’s what made the first viewing of The Blair Witch Project and Paranormal Activity so much fun. With unknowns as the leads, it added credibility to the whole found footage aspect. If a network ever decides to try another series like The River (and I’m sure they will) they should cast newcomers. There are enough actors out there… really good actors… that it would be easy to pull off. Nevertheless, I think The River deserves a second look on DVD. This release contains exclusive bonus features, including deleted scenes and episode commentary by the show’s writers.